PET radiotracers for in vivo measurement of β-amyloid (Aβ) deposition throughout the brain are contributing to early detection of the neuropathology associated with Alzheimer's disease and enhancing prediction of individuals most likely to develop cognitive impairment and dementia. However, the fact that 30 to 50% of cognitively normal older adults have varying but detectable levels of Aβ poses challenges and opportunities in using amyloid imaging in research and clinical applications. In this review, we summarize studies of the relationship between Aβ burden and cognitive status in impaired and unimpaired individuals and the relationship between Aβ burden and cognitive function. We conclude by operationalizing the way in which information on imaging-assessed Aβ burden and cognitive performance can be used jointly to improve prediction of clinical outcomes, to enhance understanding of the role of Aβ deposition in cognitive impairment, and to identify factors that promote cognitive resilience in the presence of Aβ. The development of positron emission tomography (PET) amyloid imaging radiotracers has allowed the in vivo measurement of fibrillar β-amyloid (Aβ) throughout the brain. Amyloid imaging is contributing to the early detection of pathology and diagnosis of Alzheimer's disease (AD), to the selection and therapeutic monitoring of patients in clinical trials, and to differential diagnosis among dementia subtypes. In addition, it is enhancing our understanding of the role of Aβ in the temporal course of disease by allowing prospective assessment of early pathological changes and the cognitive correlates of these changes in Aβ deposition. PET imaging of fibrillar Aβ provides many opportunities for early diagnosis of cognitive impairment and the understanding of disease progression, but the prediction of clinical outcomes in cognitively unimpaired individuals remains challenging. The large percentage of individuals who have substantial levels of Aβ but remain cognitively normal is a potential limitation in the use of amyloid imaging for prediction of clinical outcomes. Thirty to fifty percent of individuals who are clinically normal at death have sufficient Aβ plaques at autopsy to meet pathological criteria for AD [1, 2]. Similarly, PET imaging studies also show that about 30% [3–7] of cognitively normal individuals have varying levels of increased Aβ on imaging. Some investigators argue that cognitively normal individuals with AD pathology are in a preclinical stage of AD [8–10]. However, we  and others  have shown that antemortem cognitive change in this group of 'asymptomatic AD' individuals does not differ significantly from cognitively normal individuals without AD pathology at autopsy, in contrast to the marked memory decline evident in those who develop subsequent cognitive impairment (Figure 1a). Longitudinal trajectories of verbal memory performance as a function of amyloid pathology. (a) Autopsy studies. (b) In vivo [11C]Pittsburgh Compound-B (PiB) imaging studies. 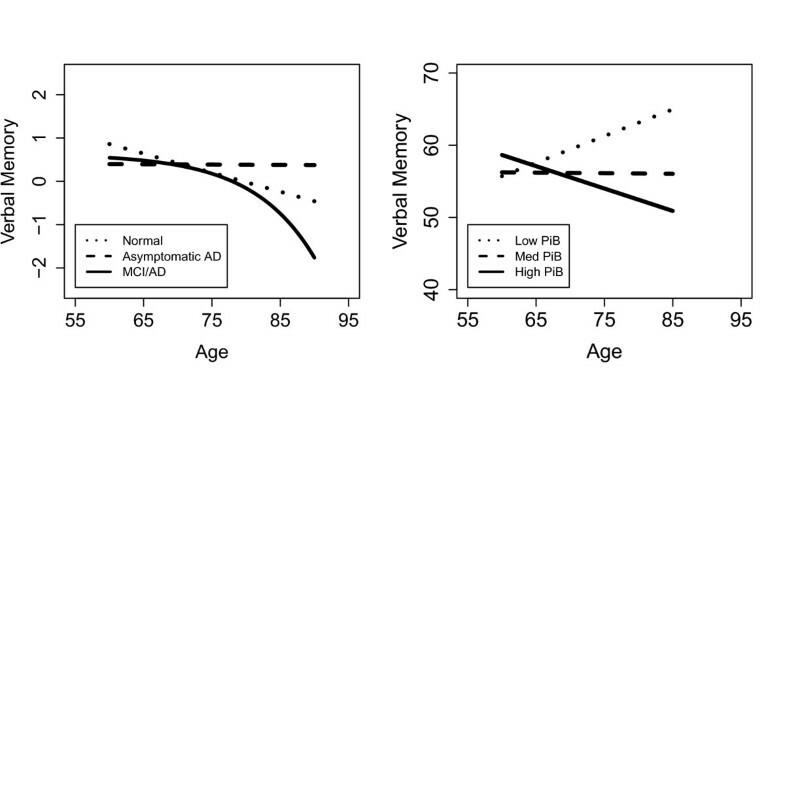 (a) Reproduced with premission from Driscoll and colleagues , showing similar longitudinal trajectories of verbal memory performance (z-scores of free recall on the Cued Selective Reminding Test) in normal individuals with and without Alzheimer's disease (AD) pathology in contrast to marked decline in individuals who later are diagnosed with MCI or AD. (b) Adapted with permission from Resnick and colleagues  and shows differences in longitudinal trajectories of verbal memory performance (total immediate free recall on the California Verbal Learning Test) as a function of PiB retention. Note that individuals in the autopsy study are older than those in the imaging studies and are more likely to have passed through the risk period for cognitive impairment. MCI, mild cognitive impairment. The challenge posed by these asymptomatic AD individuals in the application of PET Aβ imaging for clinical diagnosis has led some to question whether these tools will be useful in prediction of clinical outcomes. Individuals with elevated Aβ on PET imaging may not have passed fully through the risk period for AD and represent a heterogeneous group, with some at increased risk for cognitive impairment and others likely to remain healthy (as represented by the autopsy-defined asymptomatic AD group). In this paper, we suggest ways in which information from PET amyloid imaging can be used in combination with cognitive change to improve the utility of these measures for prediction of cognitive decline and impairment and to identify factors that promote cognitive resilience in the presence of Aβ pathology. We first review current evidence demonstrating differences in imaging-assessed Aβ burden among groups of AD, mild cognitive impairment (MCI) , and cognitively normal (CN) individuals. Next, we review cross-sectional and longitudinal studies of associations between Aβ deposition and cognitive performance. Finally, we conclude with a discussion of what amyloid imaging in conjunction with cognitive performance can and cannot tell us about prediction of cognitive impairment and resilience. We highlight how information from imaging and neuropsychological assessments can be used in combination to improve prediction of clinical outcomes and to enhance our understanding of the cognitive correlates of Aβ deposition and progression. Imaging with the radioligand [11C]Pittsburgh Compound-B (PiB) has provided strong evidence of group differences between cognitively impaired (AD and MCI) and normal (CN) older adults in global as well as regional measures of Aβ deposition (for review, see ). It is noteworthy that the level of Aβ in MCI individuals who are PiB-positive approaches the level in AD, suggesting either a plateau  or a low rate  of Aβ accumulation after the appearance of clinical symptoms. Frontal, lateral temporal, and parietal regions show consistent patterns of elevated Aβ in those with cognitive impairment compared with healthy older adults, with more variable findings with respect to group differences in the occipital and striatal regions (for review, see ). These global and regional patterns of differences between impaired and CN individuals are generally consistent across a variety of PET amyloid radiotracers. The majority of studies to date have used PiB, but a number of [18F] radiotracers for amyloid imaging recently have become available and have been applied in imaging studies of AD. These include Florbetaben (BAY94-9172), Flutemetamol (GE067) and Florbetapir (AV-45), and all show differences between AD patients and controls that are similar in distribution to group differences using PiB [17–19]. Additional studies are required to provide information on long-term predictive utility of these amyloid imaging tracers, especially in the case of MCI and preclinical AD in asymptomatic individuals. However, the availability of [18F] ligands, which have a 110-minute half-life and can be produced for regional distribution, will allow more widespread research and potential clinical applications compared to [11C] ligands, which have a 20-minute half-life requiring on-site radiopharmaceutical production. Another PET radiotracer that has been used to evaluate AD pathology is [18F]FDDNP. [18F]FDDNP differs from the other amyloid imaging compounds in several ways. It labels plaques and tangles, as well as alpha-synuclein . Furthermore, the radioactivity signal from this tracer is lower than the signal achieved with more specific Aβ radiotracers, leading to difficulties in quantification . However, an interesting application of this tracer is the potential use of subtraction measures to highlight non-amyloid pathology . By using multiple radiotracers, [18F]FDDNP shows additional binding in the hippocampal formation compared to PiB, perhaps reflecting neurofibrillary tangle pathology . Despite consistent group differences between impaired and CN individuals, amyloid imaging compounds show varying levels of elevated Aβ across individuals. In studies with PiB, attempts have been made to define values for a PiB positive study indicating elevated Aβ burden. A variety of cut-points have been used (for review, see ), but these are dependent on the specific method used for quantification - for example, standard uptake value ratio (SUVR) versus dynamic modeling of the time course of radioactivity in brain. Both cut-points and approaches that examine Aβ as a continuous measure have been used to determine relationships with cognitive status. Amyloid imaging may be especially useful in distinguishing between individuals with MCI who will progress to dementia and AD versus those who will not progress to dementia [23–25]. MCI represents a heterogeneous group, with individuals showing either AD-like levels of Aβ deposition or CN-like levels of Aβ deposition [25–28]. Approximately one-half of individuals with amnestic MCI [25, 29], characterized by memory impairment, have elevated Aβ on imaging and have an increased risk of conversion to AD (see below). MCI individuals without elevated Aβ have a lower likelihood of progression to AD [24, 25]. These individuals may be cases of misdiagnosis, may have different conditions that interfere with cognitive function, or may be false negatives on imaging due to the fact that current radiotracers do not label all Aβ isoforms . Variability in imaging-assessed amyloid burden is also apparent in older cognitively healthy adults. As noted above, the proportion of PiB-positive individuals has ranged from 20% in a study by Mintun and colleagues  to 47% in the multicenter study performed through the Alzheimer's Disease Neuroimaging Initiative . Cognitively healthy PiB-positive individuals show a range of values of PiB that are clearly detectable on imaging but are typically below those observed in AD. To date, the primary factors associated with increased Aβ burden in CN individuals are older age and Apolipoprotein E (APOE) ε4 genotype [7, 31]. For example, in the Australian Imaging, Biomarker, and Lifestyle (AIBL) study of 177 healthy controls, 33% of healthy controls were PiB-positive, with a rate of 65% in individuals older than 80 years compared with 18% in individuals aged 60 to 69 years [7, 31]. Moreover, the rate of elevated PiB binding was more than double in APOE ε4 gene carriers (49%) compared with noncarriers (21%) . Cognitively healthy individuals with elevated amyloid burden likely represent a heterogeneous group with respect to long-term outcome. While some of these individuals will progress to cognitive impairment and AD, others will remain resilient in the face of pathology. The latter group may parallel the group we have called asymptomatic AD at autopsy (and others have called high pathology controls or preclinical AD), because they do not show accelerated cognitive decline despite substantial amyloid pathology . Some investigators attribute this resilience to 'cognitive reserve' [32–34], implying greater neural complexity or plasticity at baseline, but the resilience may also reflect a more general capacity to regain homeostasis across body systems in the face of a variety of age-associated insults, including Aβ deposition. Investigations of the associations between in vivo measurement of amyloid burden and cognition are necessary to determine the extent and conditions under which elevated amyloid burden is associated with cognitive decline. When data are combined across groups of individuals with AD, MCI and CN older adults, higher Aβ burden is correlated with lower episodic memory performance [21, 28, 35, 36]. These associations are also evident in analyses pooling MCI and AD together  and in studies pooling CN and AD together [33, 38]. Correlations between Aβ burden and performance in non-memory cognitive domains also have been identified in analyses pooling groups of impaired and unimpaired individuals [33, 38]. In one study, correlations across diagnostic groups suggested that increased frontal PiB is associated with lower memory whereas increased parietal PiB is associated with lower performance on non-memory functions . Associations between in vivo neuropathology and cognitive performance across combined groups of impaired and unimpaired individuals also have been reported using [18F]FDDNP as the radiotracer [20, 39]. In addition to inverse associations between [18F]FDDNP binding and verbal paired associate memory when CN and MCI individuals were combined, [18F]FDDNP was also inversely associated with performance on other cognitive measures, including mental status and digit recall, across all groups . Spatial associations of [18F]FDDNP binding with lower performance on tests of episodic memory and frontal lobe function across groups localized to entorhinal, lateral temporal, parietal, orbitofrontal and dorsolateral prefrontal cortex . Mesial temporal associations with [18F]FDDNP may reflect sensitivity to neurofibrillary tangles in these regions. Although associations between PET imaging measures of neuropathology and memory performance are evident in analyses combining impaired and unimpaired individuals, relationships with memory performance within a diagnostic group are more complex (Tables 1 and 2). As summarized in Table 1, the correlations between cross-sectional measures of Aβ burden using PiB and cognitive performance in AD patients tend to be absent to weak [28, 35, 37, 40]. In MCI, some but not all studies indicate that higher Aβ burden is associated with lower performance on tests of episodic memory [35, 37, 41]. A recent study from a larger cohort of 57 MCI participants from the AIBL study on aging showed only a trend to a relationship between higher neocortical Aβ burden and lower long delay free recall performance on the California Verbal Learning Test, a measure of verbal memory . aIn some cases a study subsample. AD, Alzheimer's disease; aMCI, amnestic MCI; CDR-SOB, Clinical Dementia Rating scale Sum of Boxes; CVLT, California Verbal Learning Test; DVR, distribution volume ratio; FDG, fluorodeoxyglucose; MCI, mild cognitive impairment; MMSE, Mini-Mental State Examination; PiB, [11C]Pittsburgh Compound-B; RAVLT, Rey Auditory Verbal Learning Test; SD, standard deviation; SUVR, standard uptake value ratio. aIn some cases a study subsample. bBerkeley Aging Study. cAlzheimer's Disease Neuroimaging Initiative (ADNI) cohort. AMNART, American National Adult Reading Test; BP, binding potential; CDR, Clinical Dementia Rating scale; CN, cognitively normal; CVLT, California Verbal Learning Test; DVR, distribution volume ratio; MMSE, Mini-Mental State Examination; PiB, [11C]Pittsburgh Compound-B; RAVLT, Rey Auditory Verbal Learning Test; SD, standard deviation; SUVR, standard uptake value ratio. Associations between Aβ and cognitive performance are even more variable in studies of CN individuals. Table 2 summarizes findings from cross-sectional studies of CN older adults. Several investigations have shown negative cross-sectional correlations between PiB retention and measures of episodic memory [19, 41, 42], and one study indicated that cognitive reserve, measured by the National Adult Reading Test, may modify this association . However, the largest study of 177 CN adults found no significant cross-sectional correlations with episodic memory , suggesting that a few PiB-positive individuals may have a large influence on findings in smaller samples. The varied results across studies highlight the complexity of the relationship between cognitive performance and amyloid deposition at the earliest stages of cognitive decline. The few longitudinal investigations of cognitive change in relation to Aβ burden have more consistently shown associations for cognitively healthy individuals (Table 2). For example, Villemagne and colleagues  reported that greater decline in word list recall was associated with higher Aβ deposition in nondemented elderly who ultimately progressed to MCI/AD but not in individuals who remained cognitively normal . Storandt and colleagues  found that elevated Aβ burden was associated with greater longitudinal decline in episodic and working memory, as well as visuospatial ability, and we  reported that higher Aβ was associated with greater longitudinal decline in verbal memory (Figure 1b), executive function and mental status, but not visual memory. Our observations of significant relationships between higher PiB retention and greater cognitive decline in cognitively healthy individuals appear at first glance to conflict with our autopsy findings  showing similar longitudinal cognitive trajectories in older adults with and without AD pathology (Figure 1a, b). However, participants in imaging studies are younger and have not passed fully through the risk period for cognitive decline. Thus, cognitively healthy individuals with elevated Aβ on imaging include those who are in a preclinical phase of AD as well as those who will be resilient and maintain cognitive health. There are two ways that amyloid imaging may be useful in combination with cognition in prediction of the likelihood of developing AD. The first involves using amyloid imaging to distinguish among mildly impaired individuals to predict who is likely to progress and who is more likely to remain stable. Table 3 describes the results of initial attempts to use amyloid imaging in predicting outcomes in MCI. The second application combines information on longitudinal cognitive decline with Aβ status to determine which cognitively healthy individuals are at highest risk for progression to impairment and AD. aIn some cases a study subsample. AD, Alzheimer's disease; aMCI, amnestic MCI; APOE, Apolipoprotein E; BP, binding potential; CN, cognitively normal; DVR, distribution volume ratio; MCI, mild cognitive impairment; NA, not available; PiB, [11C]Pittsburgh Compound-B; SD, standard deviation; SUVR, standard uptake value ratio. In MCI, Aβ burden assessed by PiB PET has been helpful in distinguishing between individuals who will convert to AD and those who will remain stable [23–25] or develop other forms of dementia. Rates of conversion to AD in MCI individuals with a positive amyloid imaging scan are substantially higher than those with a negative PiB scan, with the latter showing less than 10% rates of conversion over 3 years [24, 25]. As described in Table 3, MCI converters may also have different patterns of PiB amyloid deposition compared to MCI non-converters , with higher PiB retention in posterior cingulate [23, 44] and frontal  regions. Okello and colleagues  identified a subset of PiB-positive MCI individuals who rapidly progressed to AD. Compared to PiB-positive slower MCI converters and nonconverters, the rapid converters had higher PiB retention in anterior cingulate, frontal, and lateral temporal cortices. In addition, the presence of the APOE ε4 allele in PiB-positive MCI individuals was associated with higher rates of conversion to AD . In CN adults, consideration of Aβ burden alone showed that risk for AD in PiB-positive individuals was 4.8 times that in PiB-negative CN individuals over a 2.4-year follow-up  (Table 3). However, no studies to date have combined PET measures of Aβ burden with cognitive performance for prediction of AD risk in CN individuals. In our concluding comments, we operationalize the way that cognitive performance, especially on episodic memory tests, can be used in combination with Aβ burden to further increase prediction of CN individuals who are likely to develop AD versus remain healthy. The ability to image brain Aβ in vivo is advancing our understanding of the neurobiology of cognitive impairment and holds promise as a tool that will contribute to the detection of early pathological changes and prediction of who will ultimately develop AD and who will maintain cognitive health. From a number of studies, it is clear that PET amyloid imaging shows robust differences in Aβ levels among groups of AD, MCI and CN individuals. When groups are combined, associations between higher Aβ and lower cognitive performance, especially episodic memory, emerge consistently across studies. Within diagnostic groups, correlations between Aβ burden and cognitive performance are less clear in cross-sectional investigations (summarized in Tables 1 and 2). The few longitudinal studies to date that included measures of change in cognitive performance over time provide more convincing evidence that increased Aβ correlates with greater decline in verbal memory, and perhaps other cognitive measures, such as executive function and mental status. The potential utility of Aβ imaging as a clinical tool for early diagnosis of preclinical AD remains limited by its lower specificity due to the high proportion of PiB-positive CN individuals [3, 5, 28, 31, 35]. Additional challenges in interpreting a positive amyloid scan are the presence of amyloid plaques in other forms of dementia, for example, Lewy body disease , and the fact that Aβ also binds to intravascular amyloid, as is the case with cerebral amyloid angiopathogy . Further, current radiotracers for Aβ imaging label predominantly fibrillar Aβ and do not measure soluble forms, providing only a partial quantification of Aβ burden. Despite these limitations, Aβ imaging in combination with information on cognitive function can help inform early detection and diagnosis of AD. The ways in which joint consideration of Aβ imaging and cognitive function may help inform prediction of AD and cognitive health are illustrated in Table 4. This simplified table shows that, in the presence of cognitive impairment, Aβ imaging will help distinguish between Aβ-positive individuals with MCI who are likely to progress to AD versus Aβ-negative individuals with MCI who have a much lower risk of progression. Aβ-negative individuals with apparent cognitive impairment may be misdiagnosed as MCI and convert back to normal, may have a different neurodegenerative disorder or other condition, or may be false negative Aβ cases due to a different isoform . Similarly, Aβ imaging may help distinguish between CN individuals with longitudinal decline in memory who are likely to develop AD versus those whose memory decline may be associated with other factors, such as other medical conditions or medications. Whereas Aβ-positive CN individuals with memory decline greater than expected for age are at increased risk for AD, memory declines in older adults who are Aβ-negative are more likely attributable to other factors. Finally, CN individuals who are Aβ-negative and do not show accelerated longitudinal decline in memory can be reassured that they are not likely to develop AD over the next several years. CN individuals who are Aβ-positive and have stable longitudinal memory performance may represent the group of asymptomatic AD or may not have reached a threshold of pathology where memory decline is evident. These findings, of course, must be interpreted in the context of an individual's age and APOE genotype, as younger CN individuals with Aβ pathology may not have passed through the risk period for accelerated cognitive decline and dementia. Longitudinal follow-up studies will determine the time course of the development of Aβ and whether there truly are individuals who are resilient to pathology or in whom the clinical symptoms are delayed. Moreover, comparisons between Aβ-positive individuals who have stable memory performance and those who show cognitive decline and impairment may lead to identification of factors that promote cognitive resilience despite pathology. 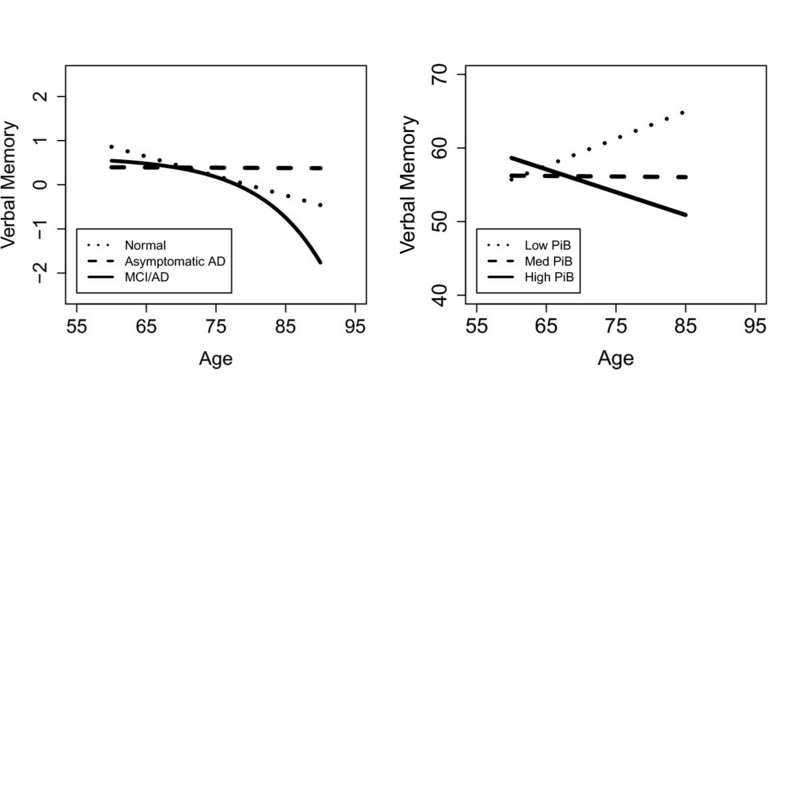 The ability to stratify longitudinal trajectories of memory performance by Aβ will also inform and perhaps revise our definition of what constitutes 'normal aging' in the absence of pathology. Finally, prediction models incorporating other factors, such as APOE genotype, cerebrospinal fluid (CSF) Aβ and Tau, as well as both regional and network-based spatial measures of brain atrophy on MRI  may increase sensitivity and specificity for early identification of AD and cognitive resilience. Cognitive resilienceb or preclinical AD? aSee Table 3 for review of rates of conversion. bMaintenance of cognitive health despite β-amyloid pathology. AD, Alzheimer's disease; CN, cognitively normal; MCI, mild cognitive impairment. In addition to its contributing role in early identification of individuals at greatest risk for AD, amyloid imaging is also aiding in drug development and elucidating the regional distribution and temporal course of the neuro-biological changes leading to memory loss and AD. Amyloid imaging informs the selection of participants in therapeutic trials - for example, for anti-Aβ treatments - and may be useful in monitoring therapeutic response. In one recent trial, an 8.5% decline in Aβ level was detected in response to an anti-Aβ treatment . PET amyloid imaging is also being used in combination with CSF and MRI measures to track the temporal course and regional brain changes preceding memory loss. Amyloid deposition is hypothesized to be an early stage of the disease process, with functional and structural brain changes, including hippocampal volume loss, occurring closer to the manifestation of clinical symptoms . Imaging tools provide information throughout the brain, directing attention to the regions showing the earliest amyloid deposition and volumetric changes. In some cases, such as early amyloid deposition in precuneus/posterior cingulate, these imaging findings are focusing more detailed investigation on brain regions that were not included previously in laborious neuropathological evaluations [50, 51]. Amyloid imaging also provides the opportunity for prospective assessment of amyloid deposition in relation to changes in cognitive performance and regional brain volumes [47, 52]. The ability to track pathology over time using both amyloid imaging and CSF measures of Aβ  will enhance understanding of the temporal sequence of events in parallel and subsequent to amyloid deposition. Such studies may reveal whether there is some threshold beyond which memory impairment is evident and may identify factors that either render some individuals with substantial pathology resilient to disease or promote a delayed onset of clinical symptoms. This research was supported by the Intramural Research Program of the NIH, National Institute on Aging and N01-AG-3-2124.